Stylistically diverse upbeat jumping and jazzy blues with rousing vocals and classic sax trade offs by three of North America's best tenors;pure energy. 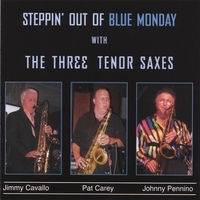 The 3 Tenor Saxes are a North American sax supergroup comprised of early rock n’ roll legend Jimmy Cavallo, Louisiana Music Hall of Famer Johnny Pennino, and Canada’s own, 5 time Maple Blues Top Horn Award winner Pat Carey. Stylistically diverse, the 3 Tenor Saxes employ classic sax trade-offs and rousing vocals to deliver jump blues, R&B, early rock n’ roll, Prima music, upbeat jazz, popular standards and a number of originals from their new CD “Steppin’ Out of Blue Monday”. Their wailing and honkin’, manic sax riffs are pure energy and reminiscent of an earlier era in rock/R&B when the tenor saxophone, as lead instrument, ruled! Pat Carey is the catalyst of the group, having played individually and excelled with the other two international stars. Pat’s exceptional abilities, in addition to his top horn player status, have earned him six Juno Award nominations with various top Canadian performers, three with Downchild Blues Band. Last year, Pat received international recognition with a WC Handy Award nomination. Pat Carey’s power and masterful sax riffs are always sure to energize a crowd. Johnny Pennino, “Tenor Sax King of New Orleans”, is recognized by legendary Louisiana talent scout and promoter, Mr. Jim Russell. “I have seen them all,” he says, “and Pennino is the best sax man Louisiana has ever produced – and that is a mouthful”. Pennino’s legacy reaches back to the glory days of New Orleans’ dynamic R&B music industry of the late 1950’s and 1960’s, when he played with the likes of Professor Longhair, Smiley Lewis, Freddy Fender and Big Joe Turner. In 1980, Pennino’s diversity landed him in Billboard magazine with his CMA Award nominated Nashville recording. Born and raised in the Crescent City, Johnny’s personal mentors include Sam Butera, Al Hirt, and Pete Fountain; he gives them credit for his amazing playing abilities. Audiences always look forward to Pennino and his awe-inspiring solos. Johnny Pennino is the quintessential New Orleans saxophonist. Jimmy Cavallo is the lead singer in this multi-talented group. Cavallo is known as one of the original creators of rock and roll. As he explains, “what became rock and roll in the 1950’s is what I was playing in the 1940’s”. In 1951, he recorded “Rock the Joint”, considered by some musicologists to be rock n’ roll’s first record. In 1956, Jimmy played the famed Apollo Theatre (Buddy Holly followed in 1957) and starred in Allan Freed’s movie “Rock, Rock, Rock” with Chuck Berry. Impressively, Jimmy was recently nominated for a WC Handy Award as comeback artist of the year. Now in his seventies, Cavallo is still “rocking” audiences with his powerful voice and honkin’ sax. With Jimmy Cavallo, audiences will enjoy being a part of Rock and Roll history and, with the 3 Tenor Saxes, will experience a musical convergence of saxophone supremacy and entertainment excellence. Johnny its been a long time.I still love your playing.Wish i could hear from you. Love it ! It's a uniquely awesome CD ! I liked the whole package: .... the jazz, the blues, the old rock n' roll, the variety, the SAXES, the artists ! ..... it has an all - encompassing, very New Orleans feel to it. ( The biography write ups, and care taken in the CD presentation are also nice added bonuses)! Thanks!